GitHub - skleinei/alfred-confluence: Alfred workflow to search for Confluence content and open it. 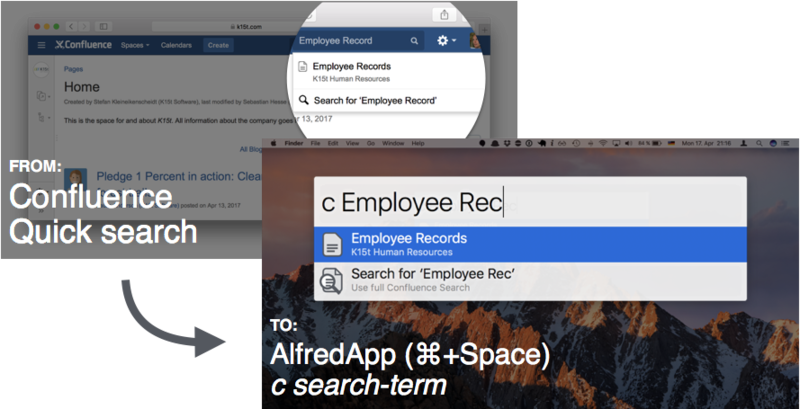 Alfred workflow to search for Confluence content and open it. Want to be notified of new releases in skleinei/alfred-confluence? The Alfred Confluence Workflow allows you to search and open Confluence pages directly from Alfred. Just hit type c <search term> to search for Confluence page. Download the latest version of Alfred Confluence from the Github releases page. Click on the release you want to download. Double click to install Alfred Confluence in Alfred. If you work with multiple Confluence systems, Alfred Confluence supports this with config file. Create the file ~/.alfred-confluence.json that contains a list of configuration for each system to be searchable. The first system will be treated as the default system. Please be aware that this will store you password in clear text on your file system. First of all, make sure you have entered the correct baseUrl, username and password/token combination. To do so open Alfred's Workflow Debugger, where baseUrl, username and password/token are logged. If you had authentication issues, it's likely that Confluence has locked you out because of too many unsuccessful login attempts. In this case open your browser and log in through the web interface where Confluence will display a CAPTCHA. Then try again. Fixed issue with authentication Confluence Cloud instances. Authentication require tokens now (see above). Improved error handling for authentication issues. Fixed issue with Confluence on custom ports. Thanks to @wooyeong and @Frogli. Trailing slashes in the confluence_baseUrl should no longer be an issue. Create a release on Github and use the same version number. The Alfred Confluence workflow was build by Stefan Kleineikenscheidt (@skleinei). It was created in Python with the help of Dean Jackson's Alfred library.